The Architect of the Capitol (AOC) achieved an extraordinary goal at the end of Fiscal Year (FY) 2015 — successfully meeting the mandate to reduce energy consumption more than 30 percent from our 2003 baseline. This 30 percent reduction is a major accomplishment on its own. But it's even more amazing when you consider that the AOC is working with buildings designed without modern technologies in mind and that many of our buildings are used in some form or fashion nearly 24 hours a day, 365 days a year. Doug Helmann, former Deputy Chief Sustainability Officer in the AOC Energy, Sustainability and Water Conservation Division and now Assistant Superintendent at Library Buildings and Grounds, described the AOC's formula for success, "Our approach to sustainability and energy on Capitol Hill is built upon three defining elements... buildings, infrastructure and people." Energy conservation measures have been installed in buildings across campus and are paid for through the energy savings generated. In 10 years, the energy conservation program has produced savings across the Capitol campus equivalent to $94 million. The enhanced technology components of our infrastructure and building upgrades provided new tools to improve our energy use decision-making and efficiency. And our people have adopted these new technologies. We use energy data and advanced control systems to solve complex issues and drive efficiency improvements. AOC jurisdictions are critical to the success of the agency's sustainability and energy goals because of their on-the-ground access to stakeholders, staff, processes and building systems. "We achieved a lot of our early savings through projects, but a substantial amount of recent savings has come from our operators figuring out how to make our buildings operate more efficiently," said Helmann. Our Energy Savings Performance Contract (ESPC) projects include converting from pneumatic to direct digital heating; upgrading ventilation and air conditioning (HVAC) controls and building automation systems; replacing failing air handling units, steam traps and valves; retrofitting existing light fixtures with highefficiency lamps, ballasts, controls and reflectors; installing LED lighting in hearing rooms and expanding the lighting control systems. The ESPC construction projects are now complete and the focus has transitioned into training, implementation and performance. We are very proud of this remarkable accomplishment of 30 percent energy reduction, but as stewards of the Capitol campus, we will continue to do our part to improve energy efficiency at the U.S. Capitol. As we continue to focus on saving energy, practicing sustainability and reducing costs, our next goal is to achieve energy savings of two percent per year over the next 10 years. "It's an ambitious goal, but I know we are up for the challenge," said Terry Watson, Acting Assistant Director for Energy and Sustainability. "When we achieve it, we will be 50 percent below our 2003 baseline." 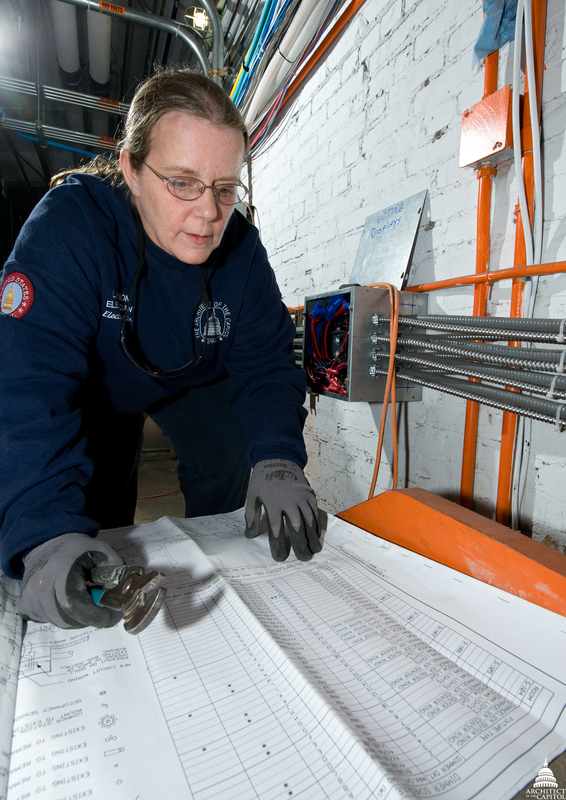 Energy Savings Performance Contracts, which use private funding to accelerate investment in energy conservation measures, enabled the AOC to make significant upgrades to its infrastructure with minimal capital investment. The AOC entered into three ESPCs – in the Capitol, House and Senate jurisdictions – which were an important element in our strategy to reduce energy consumption by 30 percent within 10 years. One of the key energy-saving initiatives in the Senate Office Buildings is an emphasis on energy-efficient lighting. 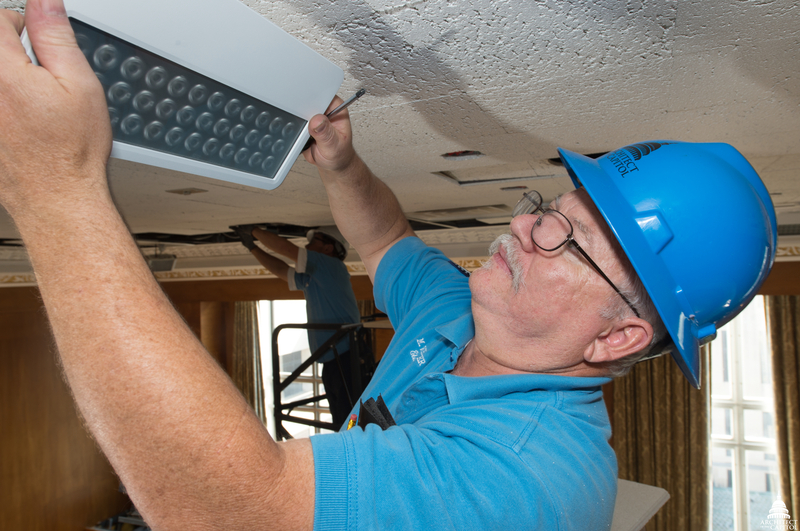 Over the past several years, nearly 44,000 lighting fixtures in the Senate buildings have been retrofitted with high-efficiency lamps, ballasts, controls and reflectors — resulting in an estimated annual savings of nearly $750,000. 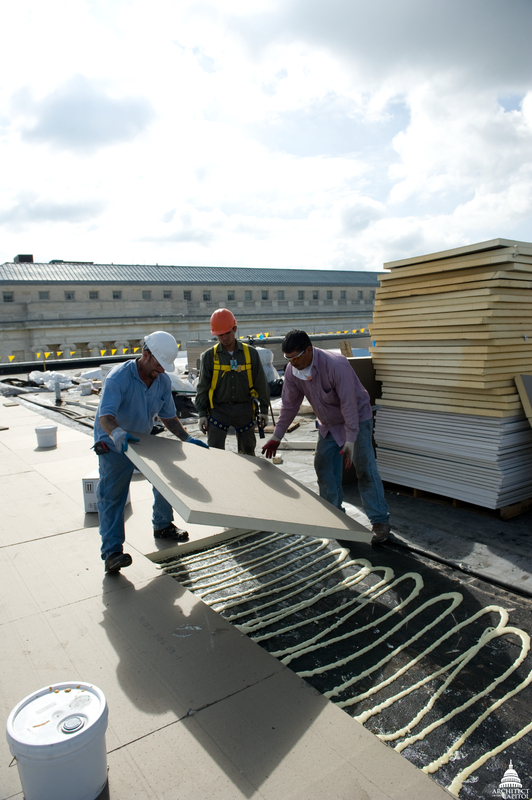 The Rayburn House Office Building needed a new roof, and in FY 2011, the AOC took the opportunity to make the new roof a cool roof. A cool roofing system helps reduce the amount of cooling needed in the summer because it reflects light instead of absorbing it. This means that less heat is transferred into the building below, which helps keep the interior spaces cooler — and that equates to cost savings. The U.S. Capitol is one of the most familiar sights in the world. It's a symbol of our democracy and it is filled with priceless art. It houses the Congress and has high-volume public access in addition to tight security. Those are just some of the challenges faced when trying to reach 21st century standards of energy and sustainability. Amazingly, the Capitol Building had a 29 percent energy reduction over a 10-year term. Upgrading the HVAC controls, converting the air handling units to direct digital control, switching to energy-efficient lighting and replacing steam traps are some of the major projects that helped us reach our energy reduction goals. 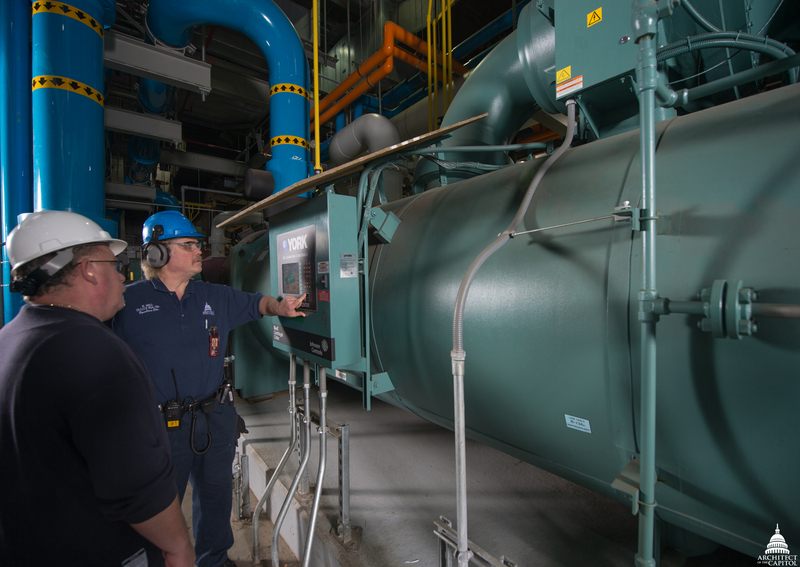 The majority of the energy at the Capitol Power Plant (CPP) is used to create the steam and chilled water that heats and cools the buildings throughout the Capitol campus. A series of tunnels transports some of the steam and chilled water to locations as far out as Union Station and the Government Publishing Office. Small improvements to the production efficiency of steam and chilled water can have great energy conservation impacts. The CPP made dramatic performance improvements in the generation and delivery of chilled water and steam throughout our facilities. By revitalizing the refrigeration plant and installing new chillers, the CPP increased chilled water efficiency with new chillers that are 20 percent more efficient. These chillers aren't small—one can use more electricity than the Rayburn House Office Building or Hart Senate Office Building on the busiest day of the year. During the summer of 2012, there was an unexpected increase in steam energy use, which risked the AOC's ability to meet its FY 2012 energy reduction goal. We instituted a steam reduction challenge and jurisdictions came together to meet both the goal and the needs of the building occupants. The AOC's web-control meter reading systems identified unseen issues and ideas and lessons learned were shared across the campus. AOC staff play a crucial role in utilizing the equipment and system upgrades to maximize energy savings, increasing occupant comfort and discovering additional energy-saving opportunities. 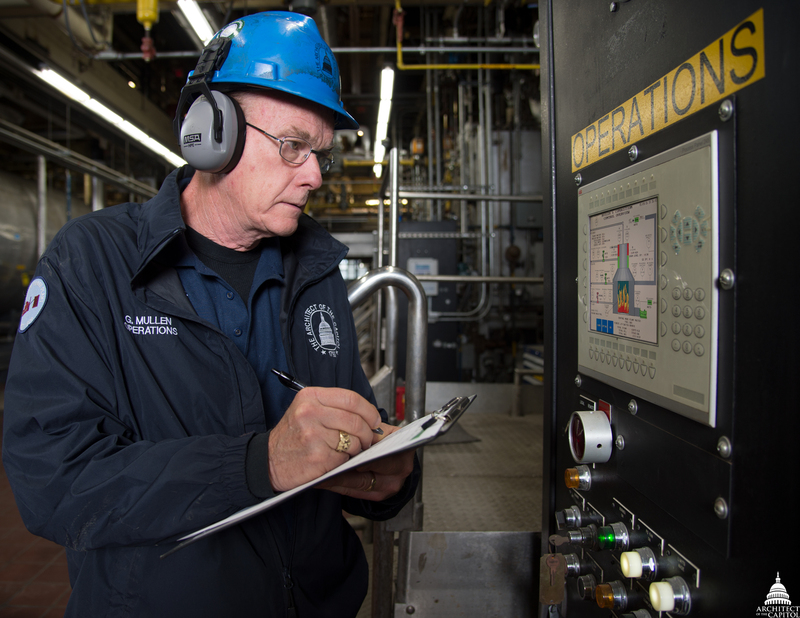 The AOC, through its operations teams across the agency, continues to focus on streamlining operating procedures and sustaining energy savings. The Sustainability, Energy and Water Conservation Division is responsible for continuing the AOC's sustainability and energy performance initiatives and addressing new challenges. 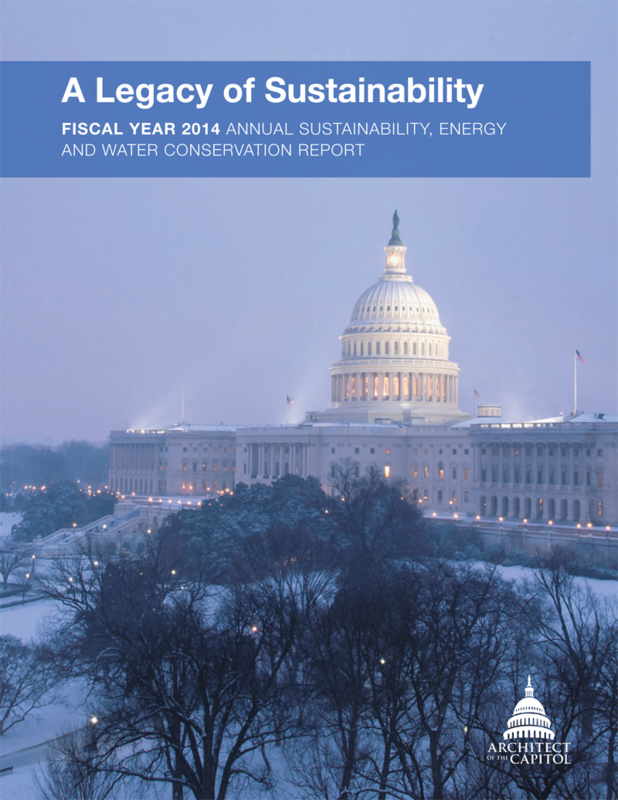 The division produces an annual Sustainability, Energy and Water Conservation report to inform Congress and the American people of the progress on our resource efficiency goals, as well as our sustainable program and initiatives. In addition, they collaborate with jurisdiction teams to determine building and site level commitments to support the agency's overall goals. The AOC maintains the facilities for the Library of Congress. The Library Buildings and Grounds jurisdiction (LBG) was challenged to reduce energy usage, while still allowing the Library of Congress to meet its mission to conserve its varied collections. Over several years, LBG staff implemented energy-savings initiatives that reduced overall energy usage. Using new technology, including the utility metering enterprise system, the operations team was able to implement system changes and receive realtime feedback on overall energy usage. The team implemented the energy reduction plan with minimal impact to clients and collections. The Supreme Court Building and Grounds jurisdiction continued modernizing its digital building control system to improve energy performance. With remote reporting, trending and scheduling of mechanical equipment, building inefficiencies are identified and teams can proactively react to inadequate mechanical systems through a form of commissioning. Using the building automation system, the team can focus on irregularities and performance problems for numerous building systems. The team fine-tuned its equipment through smart actions on mechanical settings during periods of high energy consumption and by eliminating inefficient operations. The building control system and retro-commissioning process helped the Supreme Court Building and Grounds jurisdiction develop efficient best practices.